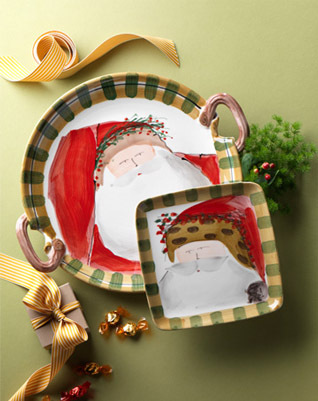 What could be more whimsical than the individual portraits of Old St. Nick, beloved by all Italians! Each Santa is created from maestro Alessandro Taddei’s childhood memories of stories his mother read to him. Made of terra bianca, each portrait is painted directly on the fired surface in Tuscany so that each stroke is seen in detail. True VIETRI collectibles and our most popular holiday pattern ever! Dishwasher safe.